Carl was born December 31, 1930 in Ishpeming to Finnish immigrant parents: Charles E. and Edith A. (Jarvinen) Pellonpaa. Carl was a 1948 graduate of Ishpeming High School. 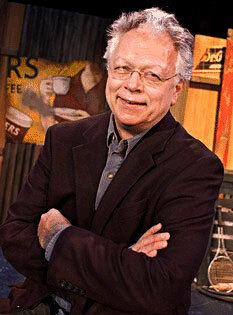 Carl career began in radio as an Announcer for WJPD Radio in Ishpeming. He signed a minor-league baseball contract with the Boston Braves, however he was injured in a hunting accident which ended his baseball career. He worked for Cleveland Cliffs Iron Company before entering the Military, he served in the U.S. Army serving in Korea during the Korean Conflict. He returned to CCI which lasted but a few years. In 1961 he found his calling working as an announcer, marketing representative and program host at WLUC-TV6. With 16% of the area's population of Finnish descent -- down from about 25% in the 1960s -- WLUC produced the only Finnish-language program in the United States, "Finland Calling" ("Suomi kutsuu" in Finnish). The station started the show March 27, 1962 at the suggestion of a local travel agent who sought to boost travel to Scandinavian countries. The show was hosted by Carl Pellonpaa for 53 years; from it's beginning until its end. Early programs were produced live and featured books, photographs and Finnish music. Camera operators had to learn a few words of Finnish just to be able to follow the show. The one-hour weekly Sunday morning program regularly featured Finnish visitors to the region including two Presidents of Finland, the Prime Minister of Finland, a number of Ambassadors, Consul Generals of Finland, members of the Finnish Parliament, numerous entertainers, choirs, teachers, students, and many, many others. Pellonpaa has hosted many tours to Finland and dozens of dances featuring Finnish music. In 1988 he was awarded the Order of the White Rose in 1988 from then President Mauno Koivisto for hosting the program and for the number of tourists that the program inspired to visit Finland. Carl was elected to the Marquette County Board of Supervisors (Commissioners) serving 9 years and Chairman in 1971 and 1972. He was also appointed by then Governor William Milliken to State Highway Commission (now Transportation Commission) in 1973 and served in that capacity for 13 ½ years. Carl was a member of Suomi College Board of Trustees, Bethany Lutheran Church in Ishpeming, the Ishpeming Ski Club, Ishpeming ELKS Lodge 447- Past Exalted Ruler and Trustee, VASA Lodge 164- Ishpeming, American Legion Post 136- Past Commander and U.P. Chapter League of Finnish American Societies. Carl received many distinguished honors and awards throughout his life, some of which includes The Knight of the Order of the White Rose, he served as Honorary Consul of Finland for 2 terms, 1970 and 1990. In 1988, The Marquette Welcome Center was named in his honor for service on the Michigan State Transportation Board of Commissioners, in 1994 was Recipient of Gold Award from the Finnish Society at Finn Fest USA, The Board of Directors of the Institute of Migration had granted the 2012 John Morton Award to an accomplished person engaged in research, documentation on the subject of Finnish migration or multiculturalism. Carl served as Chairman of Finn Fest 1996 held in Marquette, Michigan. He enjoyed attending many Finn Fest celebrations throughout the country. Carl traveled to Finland 32 times and visited all of the Scandinavian Countries. He worked closely with Holiday Travel Vacations, conducting many bus tours throughout the United States. Carl loved his wife Doris, family, church, camp, sauna, baking, cooking, ski jumping, music, baseball, humor, public speaking, reading, television, movies, using his I pad, all sports, announcing at many events especially ski jumping tournaments. He was a true Detroit Tiger and Lions fan! 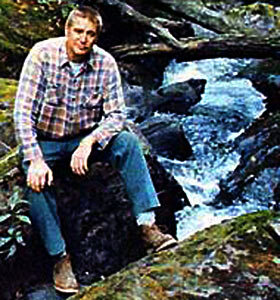 Known and beloved as a storyteller, mentor and friend to countless numbers of followers and fans both regionally and internationally through his books, travels and speaking tours, Rydholm inspired and influenced the way many think and relate to their personal life story, their cultural identity and their relationship to the Upper Peninsula's wilderness heritage. Born on March 11, 1924, to Eber F. and Louise Harwood Rydholm, Fred was a graduate of Albion College and served as a Navy hospital corpsman during World War II. For most of his professional career, Rydholm taught seventh- and eighth-grade general science, retiring from Marquette Public Schools in 1982. His public and personal avocations over the course of his lifetime were numerous, including 14 years as a Marquette city commissioner, a candidate for state representative in the 1960s, a loved and well remembered counselor at Bay Cliff Health Camp, and a wilderness guide at the Huron Mountain Club. On December 26, 1953, Rydholm married June Elsie Beltrame, and from 1953 to 1968 the couple served as codirectors of the children's program at the Huron Mountain Club while raising their two sons, Fred K. and Dan. In 1949, Rydholm purchased the halfway camp on the Bentley Trail, the historic footpath connecting the McCormick Wilderness Estate near Michigamme and the Huron Mountain Club. Rydholm would spend the majority of the rest of his life documenting the history of the people and places associated with this overland route through some of the most pristine wilderness in the country. His lifelong efforts culminated in his two-volume work, "Superior Heartland: A Backwoods History," which is now considered a regional classic of its genre. In his later years, Rydholm turned his attention to the region's mining and mineral heritage, hoping to confirm his theory that the natural native copper endemic to Isle Royale and the Keweenaw Peninsula was a focal point of contact and trade in the ancient world. His theory along with a personal meditation on his lifelong fascination with native copper is presented in his last book, "Michigan Copper: The Untold Story," which, in many ways, serves as epilogue to his earlier work and an epitaph to his life. Rydholm's final years were devoted to the vision of building a museum in the Upper Peninsula's Copper Country, where the world's largest piece of float copper could be displayed to dramatically show the area's peculiarly unique mineral heritage. As president of the Ancient Artifact Preservation Society, it was Rydholm's dream to raise the necessary funds to accomplish this goal. Rydholm is survived by his wife, June; and his two sons, Fred K. (Pat Burke) and Dan (Kathleen Heideman). There is a site on the west slope of Superstition Mountain that sits silent and abandoned. It's era of copper and gold mining long forgotten. Questions are still asked in the Apache Junction, AZ area about the waste dump and what was located there many decades ago. This abandoned area was the location of the Palmer Mine. Dr. Ralph Fleetwood Palmer was born in Marquette, Michigan on November 4, 1875. Palmer attended the University of Michigan from 1894-1898 graduating in 1898. He then attended the College of Physicians and Surgeons at the University of Illinois in 1900. On December 1, 1900 he was made a member of the house staff at Cook County Hospital in Chicago. On June 1, 1902 he received his diploma, and immediately moved to Arizona Territory. In 1903 Palmer had his first encounter with the Superstition Mountains. A group of Pima Indians refused to work on the road gang because an old chief was afraid one of his wives was going to die. The two wives had been in a vicious fight and one had a severe hatchet wound to her skull. Some thirty-seven miles away, Palmer was sent to Government Well to see what he could do. None of the road gang would return to work until the wives were better or had died. Palmer was able to save the lives of the two women and in doing so, he became a friend of the old Pima chief. Chief Ash Nash Ni told Palmer he was guarding the secrets of Ain-We-Gophon (Superstition Mountain) and further explained that his wives would soon give birth to a son for him to pass on the secrets of the mountain. The chief also told Palmer that his sons would guard the secrets of Ain-We-Gophon and would forever make peace with the Pima Earth Gods. This was Dr. Palmer’s first contact with the mysterious Superstition Mountain. Palmer wasn’t sure there was any truth in what he heard, but he became intrigued with the mountain for the rest of his life. Palmer’s first mining property in the Goldfield area was originally located by William A. Kimball, who had staked his claims many years before in 1886. Kimball had shipped a considerable amount of high-grade ore from this mine prior to 1900. The Buckhorn-Boulder Claims were the oldest mining claims in the immediate area excluding the Lucky Boy. An Arizona newspaper reported on February 28, 1900, the following: “W. A. Kimball of Mesa is shipping some high producing ore from the Buckhorn Mine, two carloads being loaded yesterday.” The rich ore referred to was copper and was taken from a shaft some seventy-five feet deep. The old Buckhorn Mine is the present location of the Old Palmer Mine. Kimball died around 1904, and the mine remained inactive until 1917. A group of Mesa entrepreneurs acquired the mine and after extensive investigation they decided to extend the old shaft to 120 feet in depth. The Buckhorn and Boulder Mining Company decided to initiate this work. The shaft was further sunk to the depth of 215 feet between 1917-1918. During the summer of 1918, a “drift” was extended 35 feet to the south of the shaft and there in an isolated pocket a single specimen of ore assayed 882 ounces of gold per ton (Drift is a general mining term, meaning a near-horizontal passageway in a mine, following the bed of copper or vein of ore). Many other assays ran more than 400 ounces to the ton in free gold. World War I virtually shut down operations at the mine in August of 1918. The property then remained closed for the duration of the war, with an outstanding note against it for $5,000, except for the annual assessment work done in the name of the corporation. The property was sold at auction in payment for outstanding indebtedness in 1926, at which time Dr. Palmer, bought the property. Palmer made several attempts to finance the property and reach the pot of gold he believed lay just beyond the 215-foot level. It would require another ten years before Palmer was able to raise sufficient capital to sink the shaft. 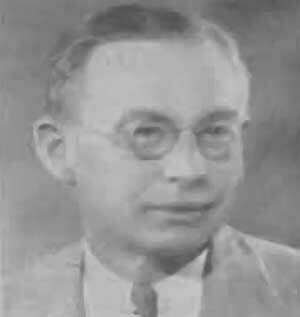 Dr. Palmer organized a company to open the mine in 1937 and put it on a paying basis. Palmer and nineteen other investors, in need of financial backing, formed the Ain-We-Goph-On Tribe. The name was based on an old Indian legend about the origin and destiny of Superstition Mountain. The company was eventually known as the Superstition Sage Mining Company. Continued efforts by the company failed to uncover Palmer’s pot of gold. Palmer was a dedicated and sincere man who believed there was a rich deposit of gold just beyond the 215-foot level. He and his associates invested several thousand dollars in a vain attempt to extract the gold they believed existed there. The mining operation came to an abrupt end in December of 1947 when Enestro Jacoeo was killed in a premature explosion at the bottom of the 225-foot shaft at the Palmer Mine. Frank Hedworth, the hoist operator at the time, later reported he heard the blast before the signal was given to raise the men in the shaft below. This indicated to him a premature blast. The mine was abandoned in 1949, but Palmer continued to do the assessment work on the mine for a short time. The old shaft was used as a well to supply water for the Barkley Cattle Company from 1950-1962. On many occasions during the summer of 1959, I started the pump at the old Palmer to water cattle. Recently, on a ride to the old Palmer Mine I found most of the old dump obliterated and planted over. Often when I look up at that spot on the side of Superstition Mountain I reminisce about the history of one great Arizona Pioneer. Dr. Ralph Fleetwood Palmer was a true Arizona pioneer and in his book Doctor on Horseback he tells how it was in those early days before statehood, serving the medical needs of early Arizona pioneers before the arrival of the automobile. He was truly an amazing man, having once stood at the side of President Theodore Roosevelt, he was the first mayor of Mesa after statehood in 1912. He was instrumental in the organization of the Mesa Rotary Club and was the club’s first chartered president. Palmer conceived the idea of the first real hospital in Mesa, raising some $10,000 to finance the construction of the South Side Hospital. Some claim he brought modern medicine to the pioneer community of Mesa in 1907. His memoirs reflect his love, determination and efforts to help settle a primitive frontier and help others cope with medical problems. Throughout his long life in Arizona his love for mining and the Superstition Mountains intrigued him until the time of his death in Mesa on December 17, 1954. Gale LaJoye grew up and lives in Marquette, Michigan. It is there that LaJoye began and continues to study how people respond to situations and each other. Over time, LaJoye has learned how to integrate his observations into funny and poignant stories without words – stories that turn sorrow into joy and inspire us to embrace life. 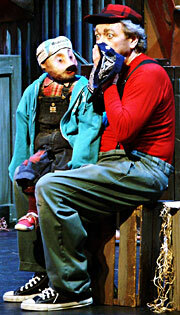 Early on, LaJoye developed a reputation for portraying complex characters - characters that rely on physical humor and non-verbal communication. After college, LaJoye immersed himself in pantomime and the Japanese art of Kabuki. In 1973, LaJoye ran off to Florida to be with the greatest show on earth - Ringling Brothers and Barnum and Bailey Circus. While with the circus, he mastered the art of gesture, silent communication, and poignant short story telling. 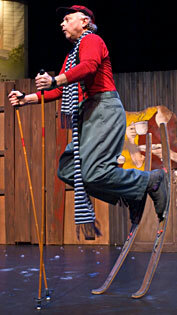 Within four years, LaJoye became “Boss Clown” - one of the highest honors in the circus tradition. In 1979 fate dealt Gale LaJoye a crushing blow. After a car accident, his doctors advised him he would “never walk again.” Driven to be a performer, LaJoye immediately began rebuilding his body and using humor to heal his mind and soul. Today, you would never imagine LaJoye was once paralyzed. After premiering Snowflake in 1990, LaJoye embarked on a global tour. LaJoye’s Snowflake has toured throughout Asia, South America, Australia, Mexico, Canada and the United States. Hailed by critics and audiences alike as “a must see,” LaJoye has performed Snowflake thousands of time. In Japan alone he toured Snowflake to 280 cities. When not on tour with Snowflake, LaJoye is developing his next tour de force. His next production is slated to premiere after this Encore Tour of Snowflake ends. Like no other, Gale LaJoye weaves different schools of theatre into funny and poignant stories that help adults and children turn sorrow into joy. Peter White is regarded as the Grand Old Man of the U.P. He came in contact with the U.P. in 1845 when arriving at Mackinac Island, at the time the center of trade and enterprise on the Great Lakes. He worked there for two years with the U.S. Lighthouse Service and as a handyman in a trader’s store. In 1849 he joined a party heading for the news iron country, and landed at what later became the city of Marquette. There he worked as a timekeeper, as a guide through the woods to Escanaba, and the keeper of the Marquette Iron Company’s store. In 1852 White, then 21, was appointed postmaster of Carp River, later renamed Marquette, and held the office for 12 years. During that time he was aware of the developing iron mining industry and the opportunities it offered, and though he didn’t have the funds to invest in it, he opened a supply store for miners, and got into banking and real estate. When the Soo ship canal opened in 1855, he was ready for the new era that ensued. That year he was elected state representative and went to Lansing (the trip took 15 days on snowshoes to Escanaba and by foot and stage the rest of the way). In 1857 the federal land office was moved from the Soo to Marquette and White was made its register. As time allowed, he studied law, was admitted to practice before the U.S. Supreme Court, and had his law office in Marquette for 10 years until other interests absorbed him. By the time the Civil War rolled around he was easily the town’s first citizen, his bank had become a national bank, his real estate ventures were successes, and through his connections he was selling iron and was convinced the demand for the ore would increase drastically to meet the nation’s industrial needs. On a trip to Detroit he found some of his own ore on the docks and promptly bought it, along with other stockpiles. Going on to Cleveland, he sold a thousand tons to a single foundry, and at weeks end he had made a $35,000. profit. Here were the beginnings of his vast fortune. Over the next several decades White dealt in lands, timber, iron ore and insurance, and despite his business connections he participated actively in civic and public affairs, even serving a term as a state senator. He gave generously to the city, funds for a public library and to found a hospital, aids to churches of all faiths, and secured Presque Isle from the federal government as a city park, still regarded as one of the finest city parks in the country. He received honors, which included an appointment to the 1893 Chicago World’s Fair Commission, an honorary degree from the University of Michigan, and the naming of a new building at Northern Michigan University, the Peter White Science Hall. this is the very first photograph ever of such. Middle: Shiras himself floating in his boat taking random flash pictures. Right: The supreme results of one of those random flash pictures. "I see. You know George Shiras three. He must be very interesting." "He is. He's about the most interesting man I know." -Ernest Hemingway, from "Homage to Switzerland"
Growing up the son of a wealthy Supreme Court Justice, George Shiras III (or as Shiras signed it, "3d") first saw the woods and waters of the Upper Peninsula of Michigan in the summer of 1870, spending his summers with his father at a family cabin and hunting and fishing in the nearby woods and lakes. In the 1880’s however, he exchanged his deer rifle for a bulky 5x7 view camera (“hunting with a camera,” as Shiras called it”). Nothing in his later experience would ever dim the impression they made on him-not the trappings of wealth and position; not the influence of the finest schools; not the example of his father, a U.S. Supreme Court justice; not a promising legal career of his own. Not even a term spent in the U.S. Congress, where he introduced the legislation that would become the Migratory Bird Law-securing for Shiras an important place in the annals of conservation-could lure him away for long. Shiras returned every summer to Marquette, Michigan for over 70 years. There he married his wife, daughter of Peter White and had two children, a boy and a girl. During his early years, the interests of George Shiras 3d were those of a keen hunter and fisherman. As he grew older and his viewpoint broadened, he became more and more enthralled by the wildlife and the beauties of the region where he had passed so many years. By the late 1880s his hunting instincts had been more and more replaced by the sympathetic desire of the naturalist to know more of the lives, habits, and mentality of the wild things he so often encountered. Whatever that quality was, by 1889, his 30th year, he largely lay gun and rod aside in favor of a more absorbing instrument: the camera. Shiras' own words: "Fairly within the realm of romance were my two days travel on foot, with an Indian guide, when I was twelve years old, through a pristine wilderness to a beautiful lake hidden in the forest about twenty miles east of Marquette. The lake had been discovered by my guide the year before. I named it Whitefish Lake because a small river of that name entered Lake Superior at a point that made probable its origin in this lake, although this connection was not verified until a few years later. To this secluded place I have returned for more than sixty consecutive years, first as a boy and later often accompanied by relatives and friends. The natural beauties of this woodland haven and the interesting wildlife inhabiting the surrounding forest undoubtedly had a governing influence in developing my career as a sportsman-naturalist. It was there that, as a youthful hunter, I shot my first deer. There I took my first daylight And flashlight photographs of wildlife, and there I became an observing field naturalist." Whitefish Lake (now known as Peter White Lake) near Deerton, became the family retreat. It was a place that would soon go down in the annals of photographic history as the location for Shiras' innovative and pioneering of wildlife photography. Wildlife photography barely existed: Cameras were cumbersome and primitive, wildlife was elusive and difficult to film. But Shiras's inventive genius contrived methods and devices that resulted, among other things, in the first flash photographs and the first trip-wire photography of animals at night. Other photographers of the day had captured breathtaking scenes of landscapes and wars, portraits of people and individuals, but wildlife, it was unexplored territory. Shiras devised several methods of capturing wildlife on film. One, he would float quietly in a canoe after dark, his camera mounted on the front, intently listening until he heard noise or movement and then take a shot towards the source of the sound. Another was where he set up bait attached to trip wires where any animal taking the bait would also take its own picture. The results of some of these portrayed wildlife in never before seen images of the creatures of the wilderness going about their habits and routines. The mysteries of wildlife was presented to the world. Shiras' pictures were breathtakingly dynamic, utterly unique for the times. Enlargements of some of them, the famous "Midnight Series" of deer at night, photographed entirely around Deerton, won the gold medal in the forestry division at the Paris Exposition of 1900 and then won top prize in the photographic division as well, without ever having been formally entered in that competition! The series also received the grand prize at the St. Louis World's Fair in 1904. Perhaps inevitably, Shiras came to the attention of Gilbert H. Grosvenor, the Editor of NATIONAL GEOGRAPHIC, with results that set the standard for the Geographic's photographic reputation. The July 1906 NATIONAL GEOGRAPHIC published wildlife photographs by Shiras. Grosvenor printed 74 of Shiras's photographs accompanied by only a brief text, devoting nearly the entire issue to George 3d, a proportion unheard of in its day. The gamble was wildly successful, making this issue of the magazine one of the most significant ever published. For Shiras, it meant wide dissemination of his pioneering work. For the National Geographic Society, it meant a gratifying surge in membership and the beginning of a close and renowned association with wildlife photography. The impact of the July 1906 NATIONAL GEOGRAPHIC reached all the way to the President Theodore Roosevelt, who was so taken that he promptly picked up his pen and implored Shiras to "write a big book-a book of bulk as well as worth, in which you shall embody these pictures and the results of all your invaluable notes upon the habits, not only of game but of the numerous other wild creatures that you have observed....Do go ahead and do this work!" Shiras was deeply impressed with this appeal. But he was too busy in the active pursuit of photography and conservation work to undertake it at the time. For the next several decades he ranged all over North America with his cameras, but always returning to his beloved place at Whitefish Lake. All the while his relationship to the National Geographic Society strengthened. Between 1906 and 1932 Shiras published nine illustrated articles in the NATIONAL GEOGRAPHIC, which generated so many requests for prints that pictorial supplements of two of his prizewinning photographs of deer at night were included with the July 1913 and August 1921 issues. But as he grew older and his eyesight began to dim, Shiras recalled Roosevelt's insistence and resolved to finally write his "big book." Once again he turned to the Geographic. After all, he had been a Society trustee since 1911, and in 1928 he, in turn, entrusted 2,400 of his finest photographs to the Society for permanent retention in its files. Now he selected 950 of these images for inclusion in a two-volume work comprising extensively revised versions of his many articles. Failing eyesight in his later years forced Shiras to set aside his camera. He ultimately produced a two-volume book about his wilderness photography titled Hunting Wild Game with Camera and Flashlight, the magnum opus was published in 1935 ,the first volume of which is almost entirely devoted to the images captured at Whitefish Lake and the Upper Peninsula. Nearly 30 years had elapsed since Roosevelt had first urged him to compile it, and in belated recognition of this inspiration, Shiras dedicated the volumes to the memory of the late President. It was very warmly received. The prestigious British Journal of Nature echoed most reviews when it proclaimed the book "an outstanding work of its kind" that "must be looked upon as a classic in the history of wildlife photography." Despite this reception, the exacting Shiras unhappily discovered that many minor errors had crept into the text. So despite failing health, for he was now 78, he labored to make the necessary corrections as quickly as possible. The result was the second edition of the work, amended, revised, and enlarged, published in 1936. Still unsatisfied, Shiras even began work on a third edition, but did not finish it before he died in 1942 at 83. Thus it is the second edition, in Shiras's judgment, that is the best of the two. Summing up his own life's work as well as his relationship with the Society, its pages remain the most complete guide to the world of George Shiras, a world of woods and waters and wildlife. It remains a monument to an important early conservationist who is also known as "the original advocate of wildlife photography." Thus George Shiras III, the original advocate of wildlife photography, was (1) the first to photograph in daytime wild animals of birds from a canoe or blind; (2) the first to get automatic daylight pictures of wild animals by their touching a string across a trail or pulling on bait attached to a string operating the shutter of a camera; (3) the first to operate the camera at a distance by a string running from a blind; (4) the first to invent a means for picturing animals from a canoe by hand flashlight; (5) the first to invent a means to obtain automatic flashlight photographs for which the animals or birds fired the flash; (6) the first to use two flashlights and two cameras, one set picturing the animal when quiescent and the other set, a second later, showing the animal in action when alarmed by the explosion of the first flashlight; and (7) the first to practice wing shooting with the camera by means of a specially devised apparatus by which wild fowl and shore birds can be photographed when flying from 50 to 70 miles an hour. George Shiras III was one of the true pioneers of the Upper Peninsula of Michigan, he realized its potential then took it to a historic level. His name still graces many places in the Marquette area, as it should. He revolutionized a medium that we take for granted every day. He was an amazing man for an amazing place. Collectors note: The July 1906 NATIONAL GEOGRAPHIC was so popular that it was reprinted soon after its initial publication. These reprints are apparently indistinguishable from the originals. Reprints were also made in 1964. These are marked "reprint" on the bottom of the cover. The pictorial supplements issued with the July 1913 and August 1921 issues came folded inside the front covers of the magazines. Both unfolded and framed copies were available upon written request to Society headquarters. As can be seen in the illustrations, it is clear that these reproductions were published by the Society. Shiras had approved a series of limited-edition bromide enlargements of his award-winning "Midnight" pictures in 1901, prior to his close involvement with the National Geographic Society. These were produced in a variety of sizes, often limited to a thousand copies apiece. "Copyright by George Shiras III" would probably appear in the lower left corner of each. Eric grew up In Ishpeming, MI as a Neighbor of James “Hoolie” DeCaire. He began riding in 2004, the year he started chiropractic school. He had only done bodybuilding prior to that and was going to train for a triathlon. He ran and swam in the winter, and hit the bike in spring. After trying a bike race he has not ran or swam since. 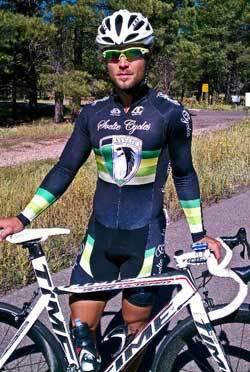 Besides being a Pro Cyclist, he is also Owner/Doctor of Chiropractic in Scottsdale, AZ. His practice and professionalism is important. It was interesting to hear that he fears crashing. "My practice and patients are important, it's hard to be a role model coming back from a race busted up." Amazingly, Eric does well with limited training. With his already long days, he only gets out a few times per week and has to make the most of his time. He is lucky to get out 4 times a week, with his commitment to his practice and patients. Marcotte went to school in Michigan, and after completing his studies he shopped around for different areas of the country to move to. He originally came to Arizona after being hired for one chiropractic office, but that didn't work out as intended. Overall, he loves racing out west. "California is pretty laid back, and ego's aren’t so big there." Marcotte’s body building background also helps in his profession, and he makes the most of his training time. When you see Eric, you can tell he sticks to his goals, he eats well, and always learns from his experiences. Eric is quite personable, you could even overhear him giving advice to fellow racers at the recent Buckeye criterium. It is interesting meeting some elite riders, some seem so unapproachable, but not Eric. We are proud to be witness to his rise to the top. 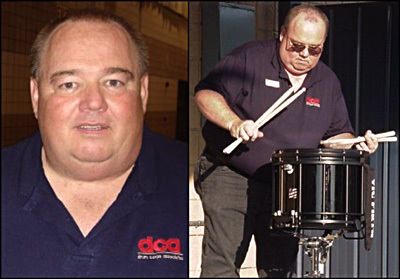 Ishpeming's own Wayne Oien, 57, took 1st place at the DCA National Drumming Competition over the Labor Day weekend 2011. Drumming has been a big part of Oien's life for many years. He began playing at age 9 and has been involved in music ever since. He's part of a musical family, including his son, Paul, who is a bass guitarist; son, Adam, who is a trumpet player; and daughter, Jenny, also a trumpet player. His brother, Alan, has a degree in music and plays the bass harmonica. Wayne Oien's never had formal lessons but took part in musical organizations and joined bands through the years. "In 2002, a friend of mine, Ken Hiettiko, told me about a world championship snare drum competition in Pennsylvania," Oien said. "Because I had never competed in an individual competition before, I didn't think i had a chance of even placing. "I thought 'just as long as I don't take last,'" Oien said. "Drummers from all over the world, including Switzerland, Canada, Japan and the United States had some of their best drummers represented. With my brother Alan's support, I entered the 2003 international rudimental drumming competition in Scranton, Pa., and placed fifth." Oien said other competitors were friendly but he was asked the same question over and over: Who did you study with? "I always said in response that I didn't study with anyone," he said. "So when I did so well, it was a surprise. I thought, 'wow.' I couldn't believe it. It was a dream come true being able to compete rudimentally with other drummers from around the world." The performances are evaluated for originality, execution, showmanship, content and dynamics by an experienced panel of judges, Oien said. Points are subtracted for dropped sticks or control problems. Since that inaugural competition in 2003, Oien has excelled in other events. He placed first in the Midwest Drumming Competition in DeKalb, Ill., in 2005. And in the DCA internationals, he took fourth in 2004; third in 2005; fourth in 2006; and 11th in 2007. Because of a work conflict, he wasn't able to participate in the 2008 competition. Then the moose accident in 2009 derailed Oien from taking part that year. The accident was a stunner: Oien and a friend were driving along U.S. 41 on their way to work at Baraga Max Prison on Father's Day, 2009 when it happened. The little car they were traveling in hit a moose. "The car was demolished and I had broken ribs, a broken palate and facial fractures," Oien said. "I had some doubt if I could perform drumming again after the accident." But the Ishpeming native fought his way back to health. And his drums. He wanted to try again, so he entered in the 2010 DCA competition and took part in the event in Rochester, N.Y., on Sept. 3, winning 3rd place. "The 2010 third place in Rochester was a real triumph for me," he said. "Especially after the disastrous 2009 accident." In 2011 Wayne trekked up to Rochester, New York to test his skills against 13 other acclaimed snare percussionists. The Drum Corps Association hosted an individual snare competition where drummers had to show skill in rhythm, finesse and showmanship. Even though he was up against big time competition, Oien took first place! "There's no way I should win this in a lot of ways, because these other guys I've talked to, they've had four instructors that were legends," said Oien. "They've had all these big instructors and basically I've had to learn most of this on my own." Oien says practice made perfect. He rehearsed his solo for months at Al Quaal Recreation Area in Ishpeming before the competition. Oien plans to continue competing in the future. In the interim, he will continue to keep busy with music. Along with Pierre Ogea, he's a founder of the Upper Peninsula's first bagpipe band, Superior Pipes and Drums. "I enjoy being involved with the bagpipe band because it gives me an opportunity to produce a full quality drum line and enjoy teaching area drummers of all ages," Oien said. Information Source: The Marquette Mining Journal. Click Here! to view "1st place National Winner Wayne Oien snare solo DCA 2011"
Click Here! to view "3rd place International Winner Wayne Oien snare solo DCA 2010"
Royden W. "Chuch" Magee, the son of Jack Magee and Harriett Mayo, was born in Utica, Michigan and spent his youth in Oxford, Michigan. He attended Griffin Business School, Ferris, and Bethel Colleges. Married for eighteen years to his wife Clare, an artist and seamstress, Chuch chose for his home a simple lifestyle, close to the earth in Michigan's Upper Peninsula. He loved fishing, snowmobiling, four-wheeling, making maple syrup, and spending time in the forest with his dogs. He was an active member of Messiah Lutheran Church, serving in a variety of supportive leadership roles, most often with youth ministry programs. Chuch Magee also served as one of the first volunteers and founders of the Cedar Tree Institute, a nonprofit organization. In that role he worked with youth from the juvenile court supporting environmental projects and planting over 1,000 cedar trees in Northern Michigan.Chuch passed away unexpectedly at age 54 on Thursday evening, July 18, 2002 during the Rolling Stones rehearsals in Toronto. At the time he was working on a tour rehearsal in Toronto, Ontario with the music industry. The cause of death is believed to be heart failure. Beginning his career as a drum and guitar technician, he has been working with Ronnie Wood and The Rolling Stones for 30 years, as a sound engineer on works like the album "I've Got My Own Album To Do" (1974), then on Rolling Stones tours, and the recent shows of Ronnie in Dublin and London last year. Also, Chuch was with Charlie on his tour with the Tentet to Japan and USA last year. He was named in 1989 by Performance Magazine as "Road Technician of the Year". In 1994 he received special recognition by a readers poll in that same publication for his leadership of the "Best Road Crew" in the music world of rock and roll. On Stones tours Chuch was Backline Crew Chief. In studio he was there too. Just like Pierre de Beauport (Keith's guitar technician) and David Rouze (bass, Mick's guitars etc), as well as all the other approx. 50 or so persons that are in Toronto now, Chuch was one of the important support persons that makes it all run. You may not have seen Chuch on stage, because your focus is normally on the band, but he was there all the time. Usually, on his knees, watching the band members, ready to rush if a guitar string would break, or whenever Ronnie were supposed to change guitars. Some times you could see that Chuch knew better what guitar to play than the receiver of the guitar, as that was his job. Before and after shows, Chuch was there for the fans. Internationally, he was regarded among his peers as representing the most highly respected and competent of his profession. To those with whom he worked and lived, he was known for his boundless energy, uncanny organizing abilities, gentle humor, and unpretentious generosity. For an extraordinary number of people from all walks of life, he will be remembered as an exquisite friend. As taken from, The Rolling Stones Fan Club Of Europe and The Marquette Mining Journal.